iChart Getting Started - NexSens Technology Inc.
After installation, an iChart icon should be located on your desktop. Double-click this icon to open iChart. The iChart Open Option window should appear. Getting Started covers the four open options. This option will open a sample iChart database. The sample database includes a basemap and several sensors. In this option, it’s not possible to interrogate the devices, but users can gain a look and feel of an iChart database. This option will open to the last iChart database used. Clicking this option will open directly to the iChart Users folder. Enter a filename for the iChart database and click Save. This is the “iChart Database Configuration” file and it will contain the setup information for all sensors and iSIC Dataloggers in the database. 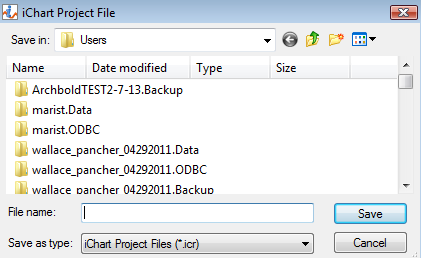 By default, this file is located in the folder “C:Program FilesNexSensiChart6Users” and has the extension “.icr”. This window can also be opened by selecting New Project from the File menu, or by clicking the New Project icon from the main toolbar. This option will open directly to iChart without a database open. 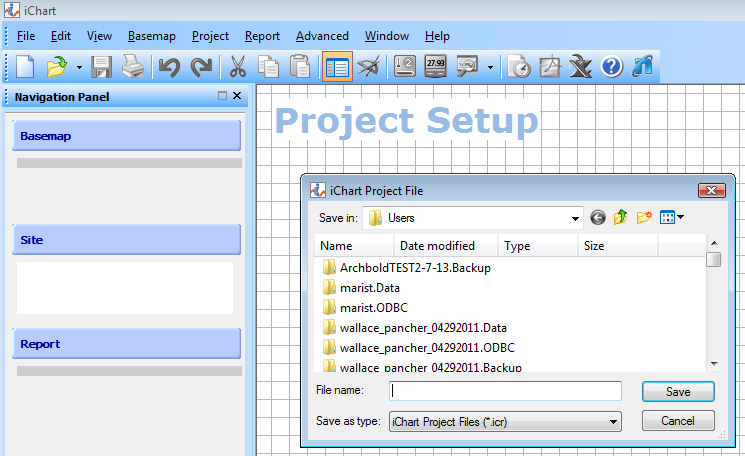 A new database can then be created by selecting New Project from the File menu, or by clicking the New Project icon from the main toolbar. This will open the Create New Project window. Figure 3: After clicking File | New Project. The iChart Open Option window can be disabled from appearing when iChart opens. Go to Edit | Preferences and uncheck “Enable startup dialog.” It can be re-enabled by checking this box again. When the Open Option window is disabled, iChart will open to the last project by default, but this may also be changed in the Edit | Preferences menu.